Each CFL bulb and fluorescent tube contains a small amount of mercury. With an estimated 4 billion household sockets in the United States being filled with these energy efficient lighting options, we all need to recycle our bulbs to keep more than 17 tons of mercury out of the environment. What to Do if a Compact Fluorescent Light (CFL) Bulb or Fluorescent Tube Light Bulb Breaks in Your Home. The Think Green From Home program starts with an easy online order. The kit is delivered to your door. You simply set up the box, line it with the Mercury VaporLok bag, fill it with bulbs, seal and ship to us using the pre-paid shipping label. 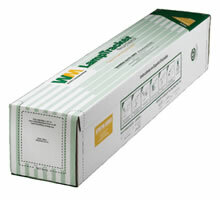 The zipseal Mercury VaporLok bag reduces the risk of environmental contamination from lamps broken during storage and shipping. 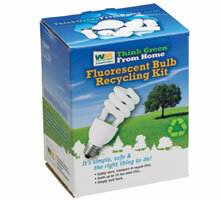 The Think Green From Home CFL Recycling Kit provides a simple, convenient solution for household recycling. It holds up to 13 13-watt CFLs. When full, seal and place at your mail box for postal return. If you have 4-foot or smaller straight fluorescent tubes in your home, Think Green From Home offers a kit that holds 7 t-12 or 16 t-8 tubes. Return shipping is by UPS or FedEx Ground.